"Where shall I begin? Which of my important nothings shall I tell you first?" Sign up as a new subscriber to Carrie's newsletter between now and 11:59 p.m. EDT on Friday, July 31, 2015 and you could win a free copy of her new book, The Suspicion at Sanditon. Simply go to the Newsletter page, fill in your information, submit the form, and respond to the confirmation email that you receive. Your email address will be entered in a random drawing for one signed copy of the hardcover edition. The drawing is open to both U.S. and international residents. The winner will be notified by email and asked to provide a mailing address. If the winner does not respond to the notification within five days, an alternative winner will be chosen. Subscribe now! 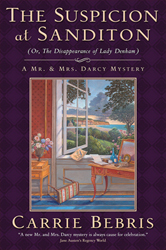 The Suspicion at Sanditon (Or, The Disappearance of Lady Denham) has just released, and is available through your favorite traditional or online bookseller. The Darcys’ seventh adventure takes them to the seaside village of Sanditon, where they encounter the cast of amusing characters Jane Austen created in her final days: heroine Charlotte Heywood; speculator Thomas Parker, his enigmatic brother Sidney, and their eccentric siblings; impoverished baronet Sir Edward Denham and his self-important sister—and most significantly, the wealthy, childless dowager Lady Denham, whose failure to appear at her own dinner party on a dark, stormy night sets the plot in motion. This new Mr. & Mrs. Darcy mystery is based on the unfinished manuscript Austen was writing when she died, and working on it—reading Austen’s developing story in her own handwriting, and speculating about her intentions for the characters she created—was both a challenge and a joy. More details about The Suspicion at Sanditon, including a synopsis, excerpt, and publication details, can be found here. To learn how you can win a signed hardcover edition of the novel, visit the latest news page. My book tour for The Suspicion at Sanditon is taking me to Ohio, Michigan, Wisconsin, Kentucky, Tennessee, and Texas—with more events being added. See the events page to learn whether I will be visiting a city near you, and check back often for new listings. I hope we have an opportunity to meet in person! The Darcys' latest adventure, The Suspicion at Sanditon, recently made the Los Angeles Times Summer Reading Recommendation List. I'm in the "Page-Turners" category with Stephen King. (Doubtless, because of the similarity of our writing styles!) See the full list here. This past week I was interviewed by The Washington Post for an article about fan fiction crossing the line into traditional mainstream publishing, a phenomenon that has resulted in books inspired by sources ranging from Jane Austen and Harry Potter to the boy band One Direction, and even films such as the BBC/PBS adaptation of Death Comes to Pemberley by P.D. James. The Darcys and I are delighted to be part of the discussion! You can read the article here. I am honored that Sheboygan’s Mead Public Library has chosen me and The Deception at Lyme as the featured Wisconsin author and book for its biannual Community Read. Several weeks of programming related to Jane Austen’s works and my own will culminate the weekend of May 4-5, when I'll make several personal appearances. More details, including the full event schedule, can be found at www.meadpubliclibrary.org/books/shebreads2013. Just in time for late-summer vacation reading (or a once-more quiet house when the children go back to school), The Deception at Lyme releases in trade paperback August 7. If you have not yet enjoyed the Darcys' latest adventure with the characters from Austen's Persuasion, escape the summer heat by joining our favorite Regency couple on a trip to England's southern coast. While Darcy and Elizabeth navigate a sea of intrigue and Darcy's sister, Georgiana, finds romance, you'll feel cool ocean breezes and droplets of sea spray as the story transports you to Lyme Regis for a seaside holiday of your own. (I hope so, anyway!) The paperback edition (ISBN 978-0-7653-2798-7) is available from your favorite bookseller or you can order online. The Deception at Lyme is also currently available in three other formats: hardcover, audio, and e-book. For more information, visit the web page for The Deception at Lyme. While teaching a weeklong fiction-writing seminar as part of the Antioch Writers' Workshop this summer, I had the pleasure of spending time with fellow workshop faculty member Hallie Ephron. A master of the suspense genre, Hallie is also a Jane Austen fan, so we found ourselves to be kindred spirits and had some great conversations. Hallie blogs with several other bestselling mystery authors at Jungle Red Writers, and interviewed me about the Mr. & Mrs. Darcy series. Read the interview here. For years, readers have been asking me whether the Mr. & Mrs. Darcy Mysteries will ever be available in audio format. I am delighted to announce that at last, one of them is! An unabridged audio version of The Deception at Lyme has just released, published by Recorded Books. It is available on CD and digital Playaway, with a cassette edition scheduled for March, and as a digital download from Audible.com. You might also find it in your local library's collection; if you don't, please encourage your library to add it. It is a wonderful recording, featuring the vocal talents of actress Leslie Carroll (herself an author of historical fiction and nonfiction) and is a pleasure to listen to even if you have already read the novel. If the audiobook version of Deception sells well, it is my hope that audio versions of the other Darcy Mysteries will follow. Il sesto romanzo della serie delle Indagini di Mr. e Mrs. Darcy: Inganno e persuasione, o: La sventurata di Lyme, è appena apparso in Italia edito dalla TEA. 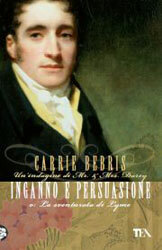 My Italian publisher, TEA Books, has just released Inganno e persuasione, o: La sventurata di Lyme (Deception and Persuasion: The ill-fated of Lyme). As with TEA's editions of the previous Mr. and Mrs. Darcy Mysteries, this Italian translation of The Deception at Lyme is a handsome trade paperback with a lovely cover. It is available in print and ebook formats. Italian readers can learn more information on the Italian page of my website. Sarete felici di sapere che è apparsa l'edizione italiana del sesto episodio delle Indagini di Mr. e Mrs. Darcy, pubblicato dalla TEA, come i cinque precedenti romanzi della serie. Spero che vi piaccia! Potrete trovare ulteriori informazioni sulla pagina in italiano del mio sito www.carriebebris.com/italiano. Thanks to your enthusiastic response to The Deception at Lyme, the novel has already gone into a second printing. Thank you! Unfortunately, a small number of second printing copies are missing the map and illustrations that are supposed to appear on pages 10-12. If you have purchased a misprinted copy, you can exchange it at your place of purchase, or contact me for instructions on receiving a replacement from my publisher. Both my publisher and I apologize for any inconvenience. On September 27 I wrote a guest post on the blog Austenprose, talking about the characters and other elements of Persuasion that inspired The Deception at Lyme. My publisher and I also gave away several copies of Deception, along with a complete set of the six Mr. & Mrs. Darcy Mysteries published to date. Thank you to all my readers who turned out for the Ohioana Book Festival earlier this month. It was a pleasure to meet you in person, and I hope you enjoyed the festival as much as I did. For those who missed it, one of the highlights for me was an interview on NPR's All Sides with Ann Fisher. We discussed the challenges of writing about some of the world's most beloved characters, and influences that led to the creation of the Mr. and Mrs. Darcy series. Along with fellow guest author Andrea Cheng, we also talked about writing and the publishing industry in general, and answered live questions from listeners. You can watch a video of the interview or listen to the podcast version by clicking here. The Tea with Mr. & Mrs. Darcy event on October 29 at Basically British sold out so quickly that we are holding a second tea on Sunday, October 30 at 1:00 p.m. All other details are the same as the Saturday tea, and can be found on the Events page. Seating for the new date is already filling up, so reserve your place soon to avoid disappointment: 937-222-1488. Would you like to read the new Mr. and Mrs. Darcy Mystery, The Deception at Lyme (Or, The Peril of Persuasion), before it officially releases? Then enter one of two drawings for subscribers to my e-newsletter. The prize for each is a signed advance review copy (the preview edition that gets sent out to reviewers) of The Deception at Lyme. If you already subscribe to my newsletter, check your email inbox for the August issue, which provides details for entering the Forward to a Friend Drawing for current subscribers. If you do not presently subscribe, visit the newsletter page of my website to sign up. Not only will you receive future news about my books and events (plus exclusive subscriber bonuses) delivered directly to your inbox, but if you sign up and confirm your subscription by 11:59 p.m. EDT August 31, 2011, you will be entered in a separate New Subscriber Drawing. Details of the drawing can be found on the newsletter page. Good luck! And thank you for subscribing. The Italian edition of the fifth Mr. and Mrs. Darcy Mystery, Intrigo a Highbury (o: Gli equivoci amorosi di Emma) has just been released. TEA, my Italian publisher, is making it available for a special price through February 13 if purchased directly from their website.